Welcome to 2015! What’s new? Most of you already know that little changes for me with the new year (although I keep writing 2014 instead of 2015 on checks, waiver forms, and consent forms). But, it just so happens that I got a new hat. That might not be a big deal to you, but it is for me. When I find something that works for me, I use it until it is dead, threadbare, broken, kaput. The part I loathe is shopping around for a replacement. My trusty Patagonia fleece hat has kept my noggin warm and itch-free (because I’m allergic to wool) for 19 years. I’ve sewn it up over 11 times. I’ll continue to bring it with me into the backcountry, but the new hat will take over noggin-duty in town. I found the brand in Crested Butte when I was in search of a good thin breathable toque for skate skiing in cold weather (I heat up very easily, even in single digit temperatures). There was a bigger selection online at Sauce Headwear and then of course, I went looking at other styles and fell in love with the tulip hat. My favorite feature of my toque is the ponytail hole (optional) – because I have a ponytail and most winter sports hats are made for dudes. 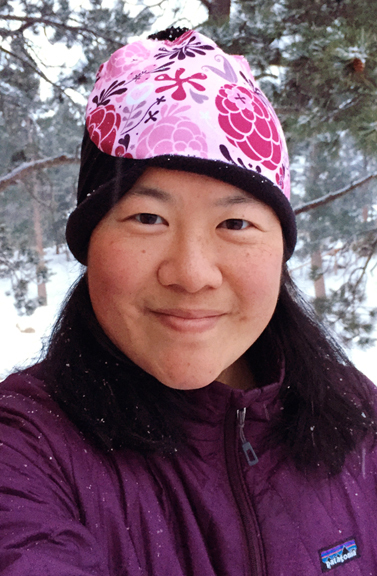 So if you’re active outside in winter and you need a functional, yet fun hat, you might want to check these out. Sauce doesn’t know I’m telling you about their hats, I just really dig how well they work for me. I test drove the toque on a backcountry ski tour Sunday morning in 50 mph winds and it was great (the hat, not the winds). 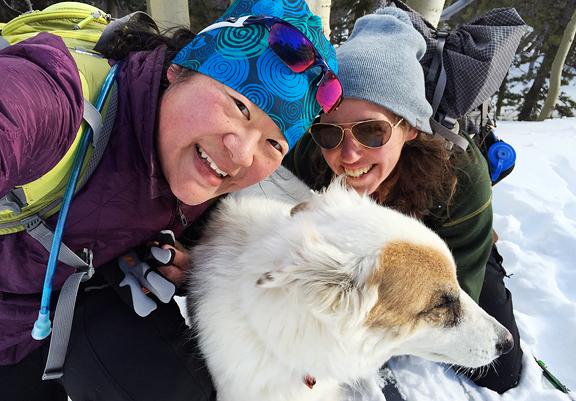 I also got to spend some quality time with my pals, Erin and Banjo, despite ground snow rudely blowing into my ears and mouth as well as winds literally knocking us over. What’s up with that, Front Range?!?! It was so nice to get some puppy time. I’ve been in withdrawal ever since Kaweah left us. It’s gotten to the point where I pet each and every dog I encounter on trails, sidewalks, in yards, stores… I was like this for years before we got Kaweah. Back then, it was just an obsession of mine to have a dog, but now I actually know what is missing from my life. Kaweah left a big hole in my heart and I’m trying to fill it by loving on fifty different dogs in passing, which is like eating a bag of Skittles in place of dinner. Jeremy’s out of town at a meeting and he texted me after his talk to let me know he was heading to dinner with a colleague. I texted back: I want a puppy. 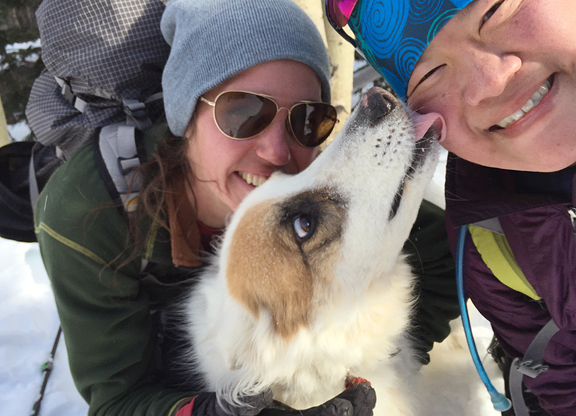 We are not impulsive people, so I know it will take time and a lot of deliberate thought before we bring a dog into our home – before we bring our dog into our lives. Jeremy isn’t ready yet, but he’s getting there. 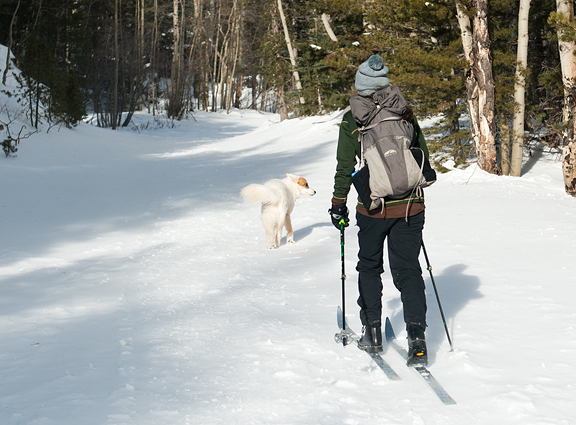 Eventually, we’ll find our Colorado mountain dog, and you’ll meet her too. In the meantime, it’s back to business as usual. We kept our holiday meal planning simple in Crested Butte because we didn’t want to spend our time in the kitchen if we could be out skiing. It was a good break. 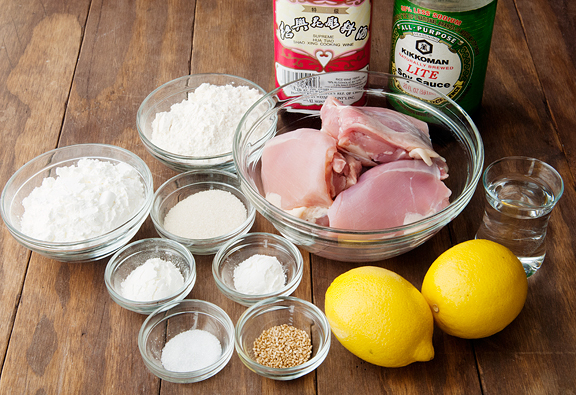 And now I’m regarding recipes with anticipation rather than dread, like this lemon chicken. I haven’t had lemon chicken in over 35 years. It isn’t something I order in restaurants and the only time I’ve ever had it was when my dad made it during one of his occasional weekend dinner extravaganzas. Even though both of my parents are great cooks, my mother and grandmother prepared all of the meals during the week when I was little. It was only when Dad had some free time on weekends that he would plan and execute a special menu for dinner. Kris and I used to bounce and giggle watching Dad cook as he referred to recipes written in Chinese characters on the thin, delicate pages of a hefty old tome. He was always in a good mood when he cooked instead of concentrating on the equations and calculations in his study room. This was family fun time. Dad’s version of lemon chicken involved breading and frying a chicken breast and then slicing it before ladling the lemon sauce over it. This recipe from Rasa Malaysia fries the chicken pieces individually, which involves a little more labor, but I rather like the result. Restaurants tend to batter fry the chicken to the point of being mostly batter and not much chicken. 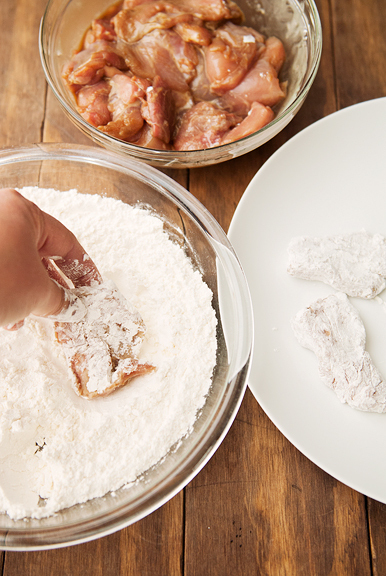 I prefer how this method is mostly chicken with a light coating of flour and cornstarch. If you want to make it gluten-free, just dredge in all cornstarch (and sub in a gluten-free soy sauce in the marinade). 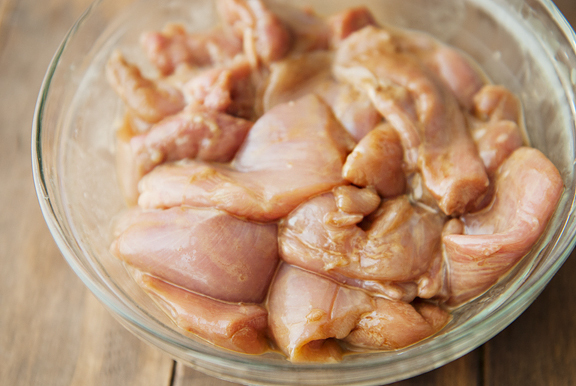 Use chicken breast or chicken thigh meat. Since I’m a fan of dark meat, I opted for chicken thighs. 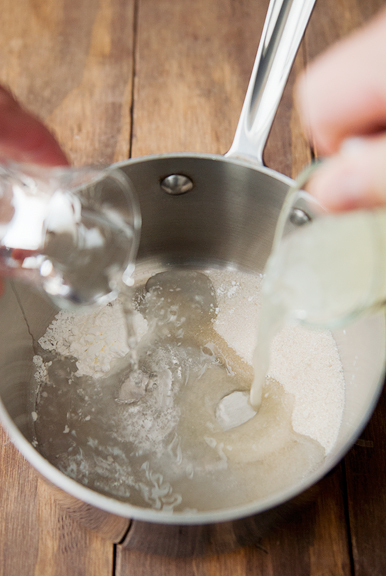 While you may be tempted to use bottled lemon juice for the sauce, I think it’s worth the extra (itty bitty) effort to squeeze a lemon or two if you have them. Taste the sauce and add more sugar if it’s too sour for your liking. 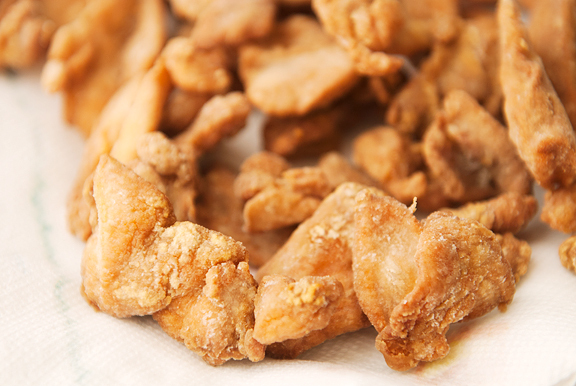 Once the chicken is fried, toss it with the hot lemon sauce until the pieces are all coated. 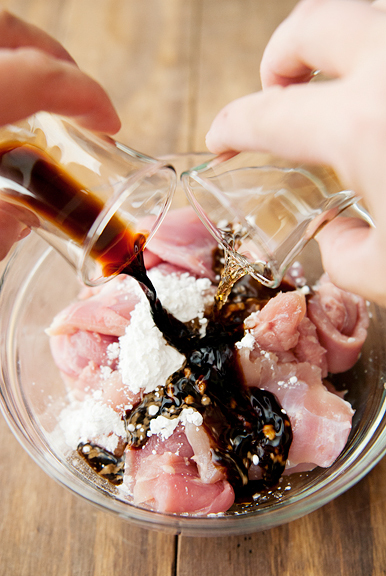 Sprinkle the sesame seeds over the chicken – they should stick because of the sauce action. We quite liked the lemon chicken because it was mostly chicken rather than greasy fried batter. And the lemon sauce tasted of lemon instead of that overly sweet “sauce” that one typically finds on Americanized Chinese food. While the flavor was probably superior to the lemon chicken that my dad made 35 years ago, it was definitely lacking in the memories and carefree goofing off of childhood. Perhaps I’ll surprise my parents and make this for them next time. 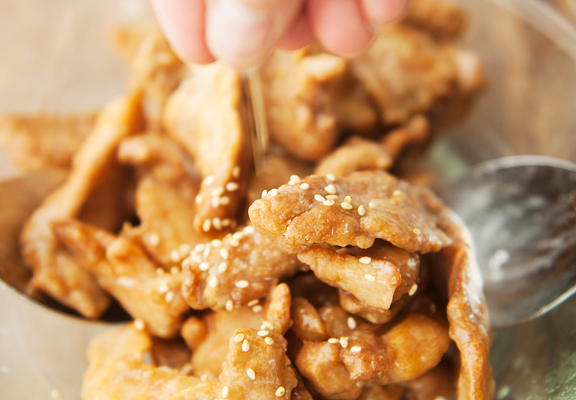 Place the chicken and the marinade ingredients (soy sauce, Shaoxing cooking wine, and 1 tbsp cornstarch) in a medium bowl and mix together until the chicken is completely coated. Let marinate for 30 minutes. 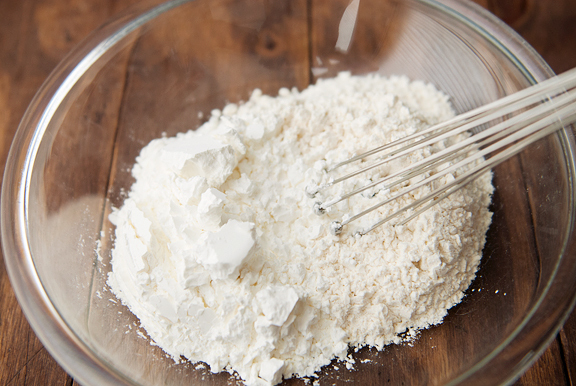 Mix the 1/4 cup of cornstarch and 1/4 cup of flour (or use 1/2 cup of cornstarch and omit the flour for gluten-free) together in a shallow bowl. Set aside. 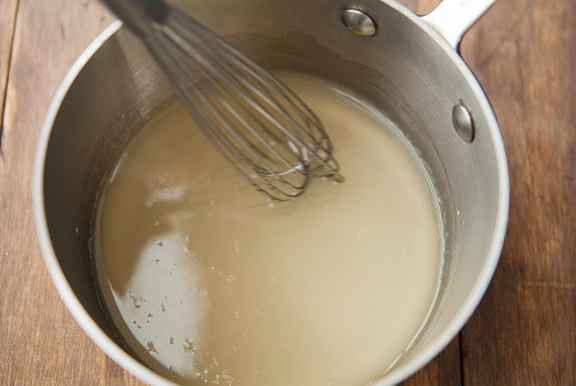 Whisk all of the sauce ingredients together in a small saucepan and bring to a boil until thickened. Turn off the heat and cover. Heat 2-inches of oil in a wok or a frying pan to 375°F. Coat the chicken pieces in the cornstarch mixture and fry several pieces of chicken at a time until golden brown (about 3-4 minutes for me). 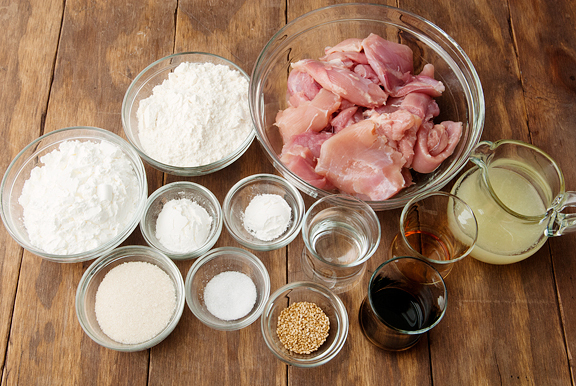 Remove the fried chicken pieces from the oil and drain on a paper towel-lined cooling rack or plate. 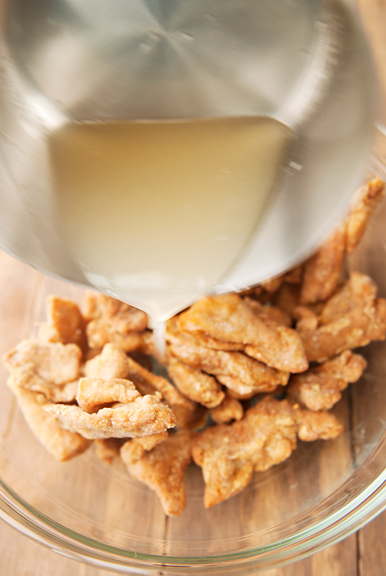 When all of the chicken is fried, place the pieces in a large bowl. If the sauce is cool, rewarm it until hot and then pour the sauce over the chicken. Toss to coat the chicken. 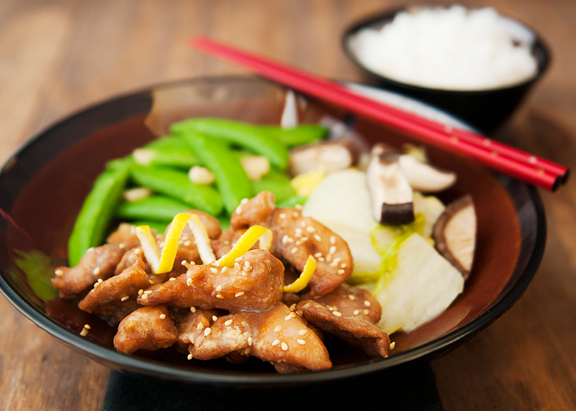 Sprinkle sesame seeds over the chicken and serve hot. Serves 4. I celebrate your changes! I know what you mean about puppy obsession. I’ve been wanting a dog for a few years now, but allergies are kind of getting in my way. I’m happy you’re ready to get a pup soon, even though Jeremy isn’t. You two are such amazing puppy parents, it warms my heart to see you giving a wonderful forever home. A wscrumptious dish! Totally my kind of food. Love the hat! And the chicken looks pretty darn good too. Looking forward to a puppy sometime in the future! I lost my 17 year old dog 6 months after my Mom passed. Was a horrible time – said OUTLOUD to everyone I knew or didn’t – NEVER GETTING ANOTHER DOG, NOT GOING THRU THIS AGAIN…4 months later – new poodle – 1 year later after that ANOTHER POODLE PUPPY! We now have 2 of the cutest dogs EVER! I’ve never had more than 1 dog at a time – 2 dogs are the BEST! This is just a hint :)! The hat looks great. I lost my dog 3 years ago. Still to soon. Will make this chicken. Question re veggies: do you steam them? Is salt and pepper sufficient seasoning? Than you! I still miss your Kaweah, and I never even met her in real life! I think about her every time I read your blog. Such a big life in that little girl. I think it must be the sign of a truly great dog that you can’t imagine a completely satisfying life without another one now that she’s gone. I hate lemon chicken in Chinese restaurants for the exact reasons you mentioned above. I’m looking forward to trying this version. And oh! The news that there may be a puppy in your life in this future year made my heart so happy, Jen! Never had lemon chicken, I always order the orange chicken, hmmmm, this I will have to try, thanks! And I love, love, love the new hat. It’s so nice to have the holidays in the rear view mirror, I do love the holidays, don’t get me wrong, but sitting down and checking your site is such a relaxing thing to do. Back to normal here. It’s my guilty pleasure, so nice to catch up, I had been thinking that MAYBE, just maybe, you had gotten a puppy for Christmas. I look forward to your next puppy and all the happiness she’ll (or he’ll) bring, along with all the pictures you’ll share. Happy New Year, thanks for the Colorado updates and snow pictures, keep ’em coming! Did I ever tell you that it was literally while reading your blog looking at a photo of K when the I MUST GET A PUPPY NOW ovulation hit me? I think I did tell you that shortly after I got my Barbie, a lab-border collie mix. She looks like a mini lab (most of the pictures on my sorry blog are of her, if you’re curious to see). It had been 1 1/2 years since my yellow lab had passed away. I went from never getting another dog, to maybe getting another, to NEEDING another. And when I saw K’s happy, sweet face it was over…and I had my puppy within a week. Keep getting your doggy fixes. I do hope you get a new pup soon! Happy new year! Looking forward to another year of gorgeous photography and delicious food! So glad you got some puppy time. I know EXACTLY what you mean about the hole in your heart and ‘gloming’ (sp?) on to any and every dog you see. I feel like a dog-stalker sometimes. People are generally very kind and let me pet and even sometimes hold their dog. It’s so very hard to be without our doggies. Mines been gone nearly 4 years and I miss him all the time. Fostering puppies for the humane society and taking care of dogs for other people has helped a little bit but it’s not the same as having a ‘resident’ dog of my own. I even borrow a friend’s dog once in a while just to have the cute little punkin around on a regular basis. My husband and I have had four dogs in our 34 years together. The first, a mut, perfect in almost every way…he was the best running companion, could run off leash through the streets of Oakland, he was tolerant and thoughtful…he had the best eyes ever…when he passed we lived for almost a year before we couldn’t take it…then came the purebred yellow lab….devoted beyond compare…loved us almost as much as she loved the water but man did we have vet bills….then came the wild thing, Harvey – part boxer, great dane and probably a little pit….nut job, but oh so entertaining and lovable. He ran into a car chasing a cat….always a story to tell about him….we were dogless for another year, maybe year and a half. My brother in law was looking online late at night and found the most recent addition, Cooper the year old yellow lab…oh my. We missed the puppy stage but he has some quirky behaviors….charming and lovable and I’m so happy to have him in our home…. I look forward to seeing who will joining you. Thanks for all your beautiful photos and delicious recipes – you do an excellent job. Can’t wait for you to get a new puppy so that I can enjoy it too. We have a darling kitty and now as we get older and we live in freezing, snowy Buffalo/Niagara Falls area, it is not something we think would be fair to bring a puppy into. So we await the time you get one and we shall enjoy each moment you share with us. And this recipe is something we love and can afford to make on our little tighter budget these days. We eat out a lot and it is generally Chinese and I can make pretty good Chinese food and have a ton of things to cook recipes with….so this is on the menu for us this week. And…..thanks for sharing your life with us! I know that you don’t know a lot of us but we are so thankful for you and your blog and wait for it to come. You definitely add some joy to our days! I used to love love dogs but 4 weeks ago a Great Pyreness attacked me on my morning walk so I’m no longer a dog lover – Womp womp. Just be careful stealing kisses from random dogs,one little nip & you’ll fall out of love quickly. Thanks for your blog posts. So much work and I love it. More food stories about your parents please. This chicken looks like a keeper. I like that the sauce isn’t too sweet. The chicken looks lovely and Banjo is cuter than cute. I still haven’t gotten another dog after losing my buddy a while ago. It’s so hard. But I’m sure both of us will find another friend down the road. Can’t wait to meet yours! You texted, “I want a puppy”? lol! I bet Jeremy was grinning from ear to ear when he read it. That’s something I would do. Be prepared….as you know, puppies are a lot of work! BTW, I love the hat! SO CUTE and it’s very you! Thanks for the recipe….it makes me think of home. One of my favorite Chinese restaurants does lemon chicken as the full cutlet breaded, fried, and sliced, but the thing I LOVE about it, is they put slices of water chestnuts between the chicken and the breading. Their sauce is also very, very light — I usually act like a big kid and eat the slices with my fingers, with little-to-no sticky fingers. But I heartily recommend trying the water chestnut thing. Jen – I really hope you decide on another lab. I think you’re a lab person. Once a lab person, always a lab person. Love the new hat, and your selfies! My sister is getting close to getting a new puppy. Hers left her just over a year ago, and it is a lonely house without a dog. She and a friend want to get a lab, or lab mix from the same litter, so they can grow up together. If you hear of a little please LMK! Rosa – thank you, my dear! Happy new year! Jean – oh, I don’t tend to like steamed vegetables. The peas are sautéed in vegetable oil with a little salt and minced garlic (or sliced garlic). 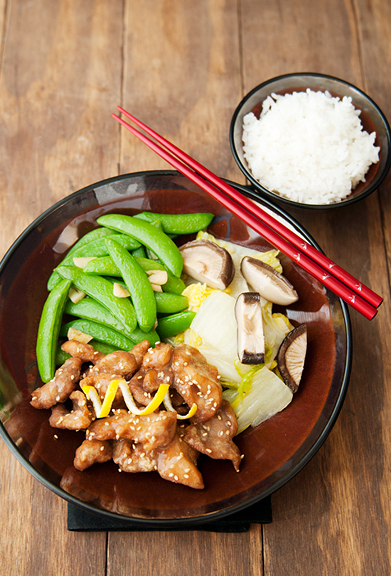 the napa cabbage and chinese mushrooms are flavored with julienned fresh ginger. Miss B – Oh sweetie, I miss her too! I am wondering now if our next dog will be as sweet or as bad or as silly as Kaweah. I just love dogs so much and feel like my life isn’t quite right without one. Melanie – it’s so true, it’s not the same as having your own pup. I hope you (and I) will find a pup to love for years and years to come! Joyce – You are so sweet – thank you! Claire – Hon, I’m sorry you were attacked by a dog, but please don’t think all dogs attack people just because you had one bad experience. I’ve been bitten (attacked) at least four different times, and I still love dogs. A large part of the solution is learning to read dogs – knowing when they are friendly and knowing when they are aggressive or even dangerous. Charlie – thank you! Happy new year! Pey-Lih – um, I'm well aware of how much work a puppy is. Kaweah was once a puppy (and a very bad one at that – but cute). Tegan – mmm, sounds good! jill – oh yay! I haven't begun searching yet, but I'll keep you posted if I see anything! Hey, guess what? I just called Sauce Headwear cos I wanted to find out whether they had dealer/store locations in Idaho and Wyoming since I’ll be there for the eclipse next week (they didn’t have the information up as they were re-doing their website). Anyway, long story short, Shayla (the proprietor) very kindly out of the blue, proposed to send some inventory along to one of the stores in the town that I’ll be staying at, so that they’d be in stock in case I wanted to buy them. I didn’t even ask for that, I just wanted to know store locations. Wow, I am so blown away by how nice she is! I had not forgotten about the tulip hat since I saw your post in 2015. I just needed to share this.